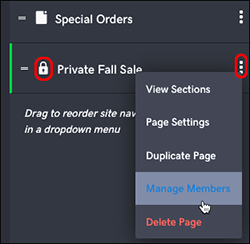 Select the upper-right Pages panel and find an existing private page (look for the lock). In the Add many tab, enter email addresses separated by commas. In Import file tab, select Browse and navigate to an existing spreadsheet of names and email addresses. Note: The spreadsheet must be formatted as a CSV (comma-separated values), XLS, or XLSX file to be uploaded. Or select Get example, then use the downloaded CSV file as a template to add your own names. When you're done in either tab, check the box by Send a password creation email to new members at this time. Then select Add or Import Spreadsheet. Note: Select Preview if you want see an example of the email your invited members will receive. Once the upload's complete, the window closes automatically and you can see your additions to the members list. GoCentral website - multiple admins?